A strip mall was being sold, and the cement walkways needed to remove sealer & paint from the walkways. The sections of cement had been painted over the years at different times, so each section had a varying degree of wear. The paint had to be stripped to look new again, and National Sealing was contracted to remove the paint. National Sealing has the ability to strip existing sealer from cement, brick pavers, strip paint from cement, using highly concentrated water pressure. This stripping equipment can attain up to 40K PSI to remove sealer & paint from various surfaces. 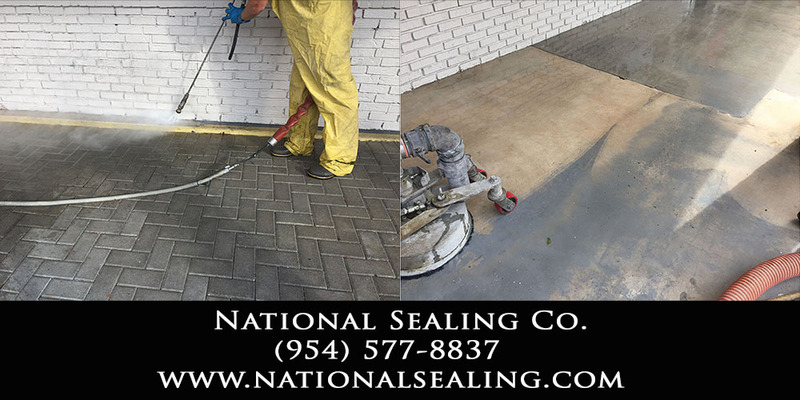 Once the pressure cleaning is completed, removing sealer & paint from the concrete walkways, National Sealing’s applies the paver COATING system that is a unique 3 part formula. IT IS NOT a conventional paver SEALER that is poured out of a container and applied. National Sealing has specialized in Cleaning & Sealing of Pavers, Anti Skid Coatings, Anti Skid, Anti Slip, Non Slip applications, and Paver Dyeing for many years. National Sealing offers nationwide consultation & applications for both commercial and residential applications. We are the largest paver sealer in the US with well over 2 Million square feet of protected surface areas. We will discuss your current surfaces and recommend potential solutions that can not only preserve new surfaces, but prolong and protect surfaces from fading, and staining. Our durable 3 part coating process versus common sealers typically lasts between 3-5x longer than typical sealers. Sealing of brick pavers, Sealing of limestone, Sealing of travertine and various other surfaces and natural stones.